Infrared (IR) energy is invisible to the human eye but can be seen by high quality monochrome (black and white) or true day/night CCTV security surveillance cameras. The Infrared (IR) energy from 360 Vision Technology’s advanced Sirius Infrared (IR) LED illuminators resides just outside the visible red section of the electromagnetic spectrum, above 700nm and below 1000nm. 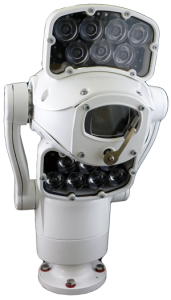 360 Vision Technology Sirius infrared (IR) standalone LED illuminators and Infrared (IR) equipped cameras can provide true 24-hour operation, delivering high definition images around the clock. Using Sirius technology, 360 Vision Technology Infrared (IR) LED illuminators are invisible to the human eye but visible to monochrome (black and white) and true day/night CCTV security surveillance cameras. This means that they are ideal for covert or none obtrusive CCTV camera illumination applications and create no light pollution. 360 Vision Technology Sirius Infrared (IR) LED illuminators are designed to ensure the optimum Infrared (IR) lighting performance for any CCTV surveillance system application, and are available up to an industry leading Infrared (IR) range of 400m.